3-letter symbols are commonly used to denote currencies such as USD for the US dollar and EUR for the Euro. Currencies are quoted in pairs, such as EUR/USD or USD/JPY. The first listed currency is known as the base currency, while the second is called the counter or quote currency. The base currency is the “basis” for the buy or the sell. If you BUY or “GO LONG ON” EUR/USD you buy Euros (and simultaneously sell dollars). You would do so in expectation that the euro will appreciate (go up) relative to the US dollar. On the other hand if you thought that there were reasons that demand for dollars would rise compared to the Euro you would SELL or ‘SHORT” EUR/USD (selling Euros for dollars). Forex is quoted in pairs, how much one unit of the base (first listed) currency is worth in counter/ quote (second listed) currency. A lot is the smallest trade size available. Rakuten Securities HK accounts have a lot size of 1K (1,000) units of currency. Account holders can however place trades of different sizes, so long as they are in increments of 1K units like, 2K, 3K, 15K, 112K etc. 0.7 pips which is 0.00007 USD. Just like in all markets, there are two prices- buy and sell, for every currency pair. The difference between the buy price and sell price is the spread, or the cost of the trade. An example on the left, the spread is 0.7. On a Rakuten Securities HK 1K lot size USD-denominated account, a pip on the EUR/USD currency pair is worth US$0.1. A pip is the unit used for price quotation change and counting profit or loss in Forex market. In Rakuten Securities HK, most currency pairs are quoted to five decimal places, the fourth spot after the decimal point (at one 100th of a cent) is typically what one watches to count “pips”. For Japanese Yen-related currency pairs, prices are quoted to 3 decimal places, whereas the second spot after the decimal point (a cent of yen) is what one watches to count “pips”. Every point that place moves is 1 pip of movement. 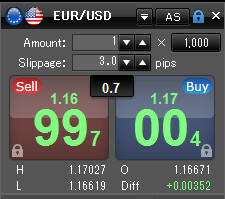 EUR/USD rises from 1.16997 to 1.17007, the EUR/USD has risen 1 pips. USD/JPY drops from 110.200 to 110.145, the USD/JPY has dropped 5.5 pips. At Rakuten Securities HK, leverage of 20:1 allows you to trade with $1,000 in the market by setting aside only $50 as a security deposit. All trades are executed using borrowed money. This allows you to take advantage of leverage. This means that you can take advantage of even the smallest movements in currencies by controlling more money in the market than you have in your account. On the other hand, leverage can significantly increase your losses. Trading foreign exchange with any level of leverage may not be suitable for all investors. In short, the leverage ratio is determined by the % of margin requirement as you use margin to create leverage. Traders holding positions for more than one day will receive or pay the interest difference between the two currencies in the pair they are trading. Though daily interest is tiny, leverage* can make this interest significant.